After the tragedy in Boston, the first couple of days manifested examples of everything that is both wrong and right about “news” and “social media” in their every permutation, as practiced in the millennium’s second decade. A small sampling of what’s out there reveals misconceptions. An unrelated fire was reported as a third bomb. A prominent national news organization mistakenly reported five undetonated explosives. Apparently, some people think that a 2002 news story about a bombed wedding in Afghanistan is a current event. There is speculation on the meaning of the date — Tax Day, Patriots Day. It’s within a week of the Columbine, Waco, Virginia Tech, and Oklahoma City anniversaries. Some say the man behind the curtain is the FBI. The AP cites Facebook as a source. Whether this is a good or bad thing is the crux of what we’re talking about here. A conspiracy theory grew up around those photos, claiming that the person in the wheelchair was really a black-ops veteran who had already lost his leg in the Middle East. Comparison photos were posted, and that rumor might be put to rest. The man in the cowboy hat was researched, and found to have a colorful biography. We started grabbing tourniquets and started tying legs. A lot of people amputated… At least 25 to 30 people have at least one leg missing, or an ankle missing, or two legs missing. Fortunately, that turned out to be an overestimation. More recent reports place the number of amputations, most of them performed in hospitals, at approximately a dozen. I was focused on a couple children coming over the finish line. And then the blast occurred, and everybody was just screaming. That runner who you’re describing fell in front of me and then the Boston police officers that were near him started drawing their guns. It was just a panic on people’s faces. … [W]e had to change this week’s SI Cover at the last minute with a photo from the many that were coming in from the scene. After meeting with senior editors late Monday afternoon, we chose to run the cover photo because we felt it truly captured the horrific moment at the end of the race — there’s a fallen runner, police with their guns drawn and loose debris from the explosion. Not everyone would have chosen this to be one of the representative photos of the Boston tragedy. Online commentators have said it looks like the police intend to beat the runner, and that the picture could be grossly misleading when taken outside of context. Someone pointed out that the minimum age for Boston Marathon runners is 18, so how were children crossing the finish line? One conspiracy-minded citizen asks what else happened in the world at the same time, that this event was meant to distract our attention from? Another has circulated the “Man on the Roof” picture, and why is this being called a conspiracy theory, and not a legitimate question? We have a strangely paradoxical situation in society right now, where individuals are often severely penalized for recording police activity with their digital devices. Yet here the authorities are requesting help from the picture-taking public. And there are videos of a merchandise stand being looted in the chaos. A number of fake charity Twitter accounts and Facebook pages have been set up in the wake of the Boston marathon bombings in an attempt to capitalize on the tragedy… Another picture of a girl who had supposedly died in the explosion was tweeted, with those behind the posts saying the children had been running for their classmates killed in the Sandy Hook shootings, in a final bid to tug at heartstrings. 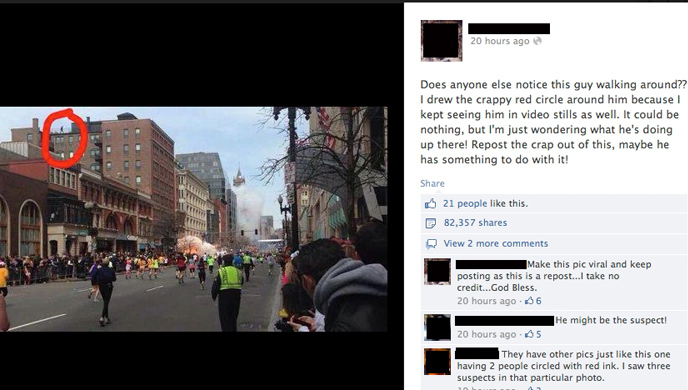 […] if our media outlets personalized such incidents in the same way they have with Boston[?] It is clear that the media has a role in making an event which happens far away personally relevant to those watching. Here’s the thing: I don’t want to hear about how this happens in other countries. I don’t want to hear your theories on the larger meaning behind this when it comes to our rights. I’m sure you’re not wrong, but I don’t want to f****** hear about it today, OK? Locate your basic humanity and let the swelling go down for those of us in the middle of all this before gifting us with your ideas on what we should think and how we should feel. Can Social Media Learn Patience? 1. People will find clues everywhere. Most of these will not actually be clues. 2. The initial speculations will be useless. We hope that the perpetrators of yesterday’s monstrosity are identified accurately and as soon as is possible. It is understandable to want to know what happened, why and by whom. I haven’t yet heard or read anything that seems informed past speculation or anxiety. Again, that’s understandable, but this is a time for caution and prudence, as much as it is also a time for sorrow and worry. Our hearts are with those who have been hurt and traumatized, and our hopes and faith are with investigators.